Simone, one of our customers recently shared one of her favourite recipes with me. As often happens, when trying something new, I add and make changes to use ingredients on hand. 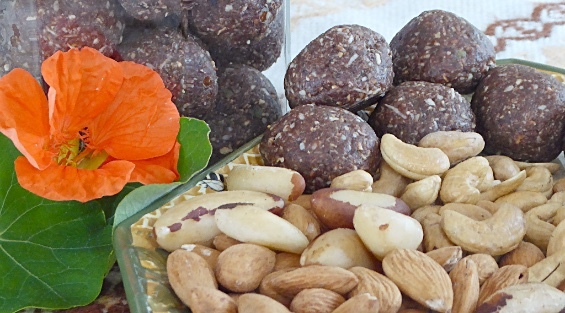 You too, can experiment using some of your favourite nuts and seeds. Place coconut oil, peanut butter and honey into a small saucepan and gently heat through. Place all other ingredients into a food processor, and blend together well. Pour the gently warmed ingredients into the processor and blend all well together. If the mixture is too dry, add a little more softened coconut oil. If mix seems too sticky, add more coconut, or put mixture in the fridge for ½ hour then roll. Roll into snack sized balls. Store in a sealed glass container in the fridge.